When you leave Puerto Vallarta International Airport you will get on HWY 200 to Compostela. Head North (not toward Puerto Vallarta) approximately 25 miles/25 minutes. You will be going through Nuevo Vallarta and a few other towns. Take the Punta de Mita offramp. You will go through one more small town called La Cruz de Huanacaxtle. Approximately 5 miles past La Cruz de Huanacaxtle, you will reach a sign that says Los Veneros and you will see a gate house on your LEFT. Note: Before you take this left, check not only the oncoming traffic, but the traffic in your rearview mirror. Since there is NOT a left hand turnout, the proper driving “etiquette” in Mexico is to pull off to the right, let both the oncoming and rear traffic go by…then make your turn. Pull up to the gatehouse where you will say to the guard "Casa Puesta del Sol, Lot 2 El Farallon" and he will let you in and you will veer right when you come to a second stone entry. 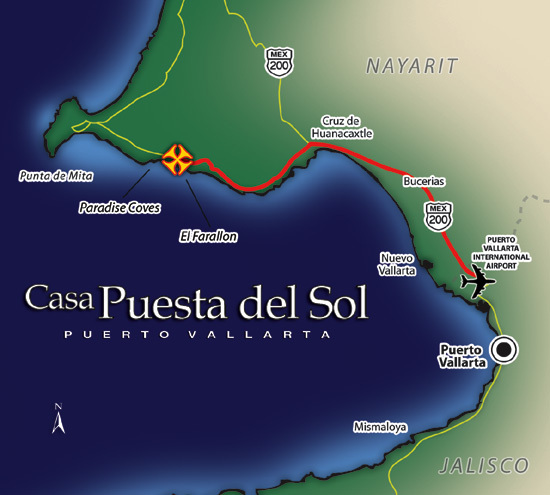 Proceed on the cobblestone road until you get to a second gate house where you will tell the guard the same thing - "Casa Puesta del Sol, Lot 2 El Farallon". He will open the gate and the house is the 2nd driveway on your left. You will see a big white wall with red flowers growing on it. The gate should be open, but if not get out and ring the call button, which is located on the right hand side of the entry gate. If you have any questions, the car rental company will be able to help and show you a map.